Build a Bear has something for Everyone! 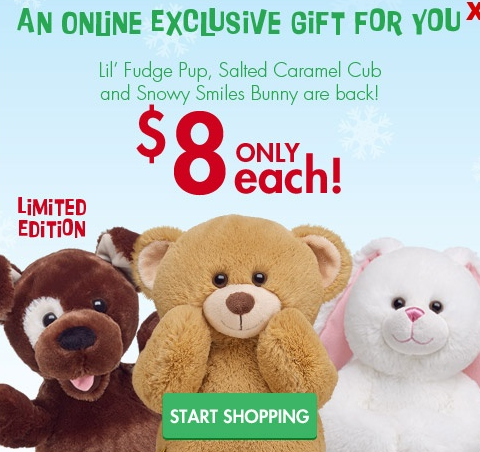 Holiday Bears on Sale!! One Reader will win a $25 Gift Card! Build-a-Bear has something for every kid. No doubt about it! There really is something that every child will love! They even have Santa Claus!! And a Polar Bear! AND they are pretty affordable too!! Several of their Holiday ones are marked down right now too. ONE lucky Wheel n Deal Mama reader will win a $25 Build a Bear gift card!! Woot! Enter below using the Rafflecopter. Good luck! Oh I would love to get Carter the 15 in. Rudolph the Red-Nosed Reindeer®!!! So precious! I would let my daughter choose! She has asked for a build a bear gift card for three christmases now. It wouldbbe amazing to give her one! This would be my daughters first build a bear and I would definitely get her clarice and Rudolph would be for my newborn son for his first Christmas. I’d love to use it to surprise my with daughter the fluttershy my little pony she had wanted for Christmas. Love build-a-bear for the kiddos! Such great quality and it is super fun! Rudolph. My son wants him in the WORST way! My daughter has had this bear she made for 7yrs we got it at the dollar store. I had no idea they actually had a build a bear workshop! This is so cool!! She’s been wanting a new bear but I haven’t been able to find the one she has! The fox – my son loves the what does the fox say video! I love the 15 in. Bearemy. I would let my daughter pick the one she wants. Been wanting to take her to one but haven’t had the money. My son is still a baby but a small stuffed animal would be just fine. I like the Frosty the Snowman bear. Merry and Bright Clarice, is pretty cute. I would pick the my little pony for my 3 year old daughter. She is OBSESSED with my little pony and would be so grateful. Thanks for this opportunity to win! The 17″ Bulldog is just too cute! That would be our first choice. I like the Cute Caramel Pup! They’re all too cute! I just can’t choose! I would pick the Autism bear in honor of my grandson. My kids would pick Rudolph! I would pick the Merry and Bright Clarice. My first choice was Frosty Snowman, but I found that I also like the elephant animal, so I would need to decide between the two–I like them both!! I liked the Hello Kitty. My son would pick out another puppy. And probably an outfit for the puppy. Yorkshire Terrier. 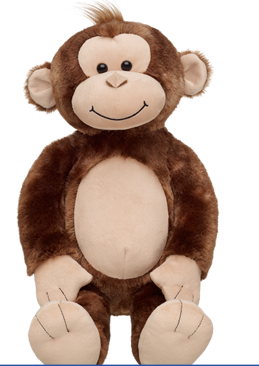 My daughter wants a real puppy but we can’t right now so if I win I’ll get her this to hold her over….I hope! My daughter loves them all! I would love to get the merry mouse or rainbow dash for my daughter! How fun would this be! Fingers crossed! !